The Algerian winger confirmed earlier in the week that he is looking for a move away from Leicester City, following a disappointing 12th place finish in the league last season after their stunning title win the season before. Mahrez has proved his ability in the Premier League having picked up the PFA Players Player of the year award in the 2015/16 season which saw him score 17 league goals and contribute 10 assists in a remarkable season. Monaco will have the burden of a busy summer with many top European clubs in pursuit of their players after the French side completed a spectacular campaign, beating big spenders Paris Saint-Germain to the Ligue 1 title and reaching the Champions League semi-finals. Lemar, who plays predominantly on the left-wing, is said to be on the radar of many top clubs after a remarkable season which saw the 21-year-old receive his first two international caps for France. The echoes for Arsenal to sign a striker each summer seem to resonate across the fan base, and due to the lack of playing time for unsettled Lucas Perez, it looks as if Arsenal may be back in the market for a striker. The 26-year-old Lyon striker netted an impressive 28 league goals in 30 appearances last season and will be on the radar of many clubs as his proposed transfer to Atletico Madrid fell at the wayside due to the Spanish club’s transfer ban. A name which is likely to be familiar with Arsenal fans having allegedly been on Arsene Wenger’s list of transfer targets for the past few seasons. The Portuguese midfielder played a pivotal role in Portugal’s Euro 2016 winning campaign and may be tempted for a move away from Sporting Lisbon having finished 3rd last season with the Portuguese side. The 18-year-old French striker burst on to the scene as one of Europe’s most exciting prospects, scoring 15 league goals in 29 appearances and six goals in nine Champions League appearances. 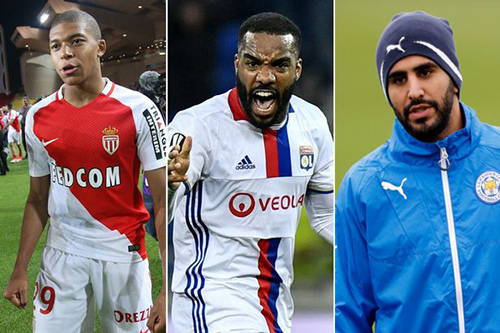 The Monaco striker has reportedly already been the subject of two huge offers from Real Madrid and Arsenal, both of which have been rejected. With plenty of clubs interested, a transfer fee for Mbappe would probably require a club smashing the world record transfer fee to acquire his services. Hi Mr winger so happy that you still with us, please don't be scared of spending we need to show the opponents that we mean business this season, plus please make sure Alexis and Mesut stay, good luck for the new season. It's seems simple...they play large, talented, physical teams and their midfield fail to show! Answer seems get some large, talented and physical mid fielders who can compete with the opponents! Being a die heart of Arsenal supporter i want to believe that Wenger must remain focus and consistent this time around to bring into the club the five listed top players in order to change the image of Arsenal.Wenger please be sensitive to the feelings of your fans or else many will turn against you. Every year Arsenal are rumoured to be interested in a series of players. Look what happens when they do not supplement the team with quality. They finish outside the top four. They need another quality forward, plus a quality holding player as well as keeping Sanchez and Ozil. If injuries persist they may need a midfielder.